Ocean aquaculture is already the fastest-growing food sector, but a lot of work remains to reach its vast potential. From sashimi to smoked salmon, ceviche to mussels Provençal, seafood dishes are among the world’s best-loved culinary delights and dietary staples. But the billions of people on the planet may love them too much. According to United Nations estimates, about 57 percent of fish stocks are exploited — meaning they can bear no more fishing without population decline — and 30 percent are over-exploited, depleted or recovering. A solution may be on the horizon. 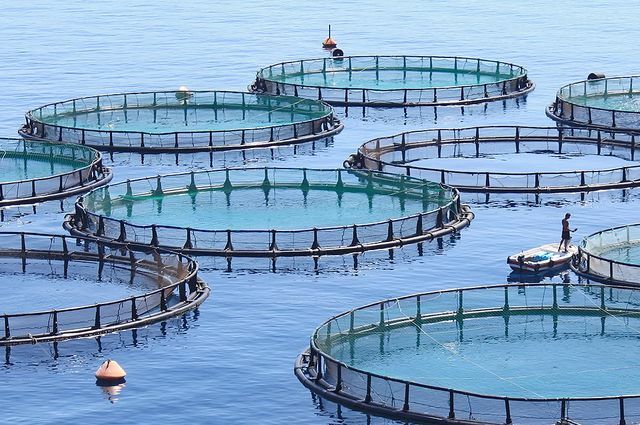 According to a study published today and co-authored by Peter Kareiva, director of the UCLA Institute of the Environment and Sustainability, ocean-farmed fish and seafood — or aquaculture — has the potential to satisfy global demand by using a tiny fraction of oceans. Freshwater fish farms have been around for a long time, but off-shore operations are a more recent development. Drawing on the findings of the paper, which maps the global potential of aquaculture, a mere 0.025 percent of the world’s oceans could satisfy global demand for fish, which is at an all-time high. An area of prime locations the size of Lake Michigan could theoretically provide as much as all of the world’s wild-caught fisheries combined. Kareiva said the findings offer hope for both the environment and people. Previous research has mostly focused on specific aquaculture topics like where to best farm specific species, said Rebecca Gentry, the study’s lead author and a marine ecologist who got her doctorate from UC Santa Barbara’s Bren School of Environmental Science and Management. When settling on the broad subject of the study, the research group — which includes non-governmental organizations, universities and industry experts — quickly discovered that there were many questions to answer. First, they had to rule out areas that can’t be farmed — places like shipping lanes, marine protected areas and offshore drilling sites. They looked at the physiology of 180 species being farmed and what environments are most conducive to them, combining data like ocean depth, temperature and the biological needs of species. They also ruled out places that would be impractical given current technology — the middle of the ocean might be farmable in the future, but the industry can’t do it effectively now.